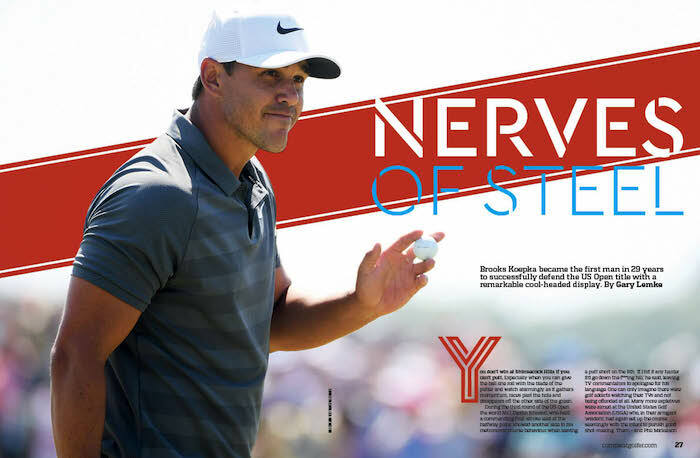 Brooks Koepka became the first man in 29 years to successfully defend the US Open title, GARY LEMKE explores his Major game in Compleat Golfer. You don’t win at Shinnecock Hills if you can’t putt. Especially when you can give the ball one roll with the blade of the putter and watch alarmingly as it gathers momentum, races past the hole and disappears off the other side of the green. During the third round of the US Open the world No 1 Dustin Johnson, who held a commanding four-stroke lead at the halfway point, showed another side to his metronomic course behaviour when leaving a putt short on the 8th. ‘If I hit it any harder it’d go down the f***ing hill,’ he said, leaving TV commentators to apologise for his language. One can only imagine there were golf addicts watching their TVs and not being offended at all. Many more expletives were aimed at the United States Golf Association (USGA) who, in their arrogant ‘wisdom’, had again set up the course seemingly with the intent to punish good shot-making. Them – and Phil Mickelson. The last time the US Open was held at Shinnecock Hills in 2004, South Africa’s Retief Goosen emerged victorious, capturing his second Major with a four-under total. Runner-up Mickelson was the only other player under par on that occasion. Some 14 years later, the USGA again instructed the course to be set up where pin placements through the first three days must have looked like dots on upturned saucers if viewed from space. The greens were not just brutal, but a lottery. On the third day Mickelson, a five-time winner on his 48th birthday, produced a moment that will have lost him many followers when he missed a putt on the 13th green. As it began to roll menacingly way beyond the hole, he broke into a jog and hit the moving ball back towards the cup. Mickelson’s infraction was partly covered in Rule 1-2, Exerting Influence on Movement of Ball or Altering Physical Conditions, which states that ‘a player must not (i) take an action with the intent to influence the movement of a ball in play or (ii) alter physical conditions with the intent of affecting the playing of a hole’. One of golf’s Hall of Famers had been reduced to an action that will haunt him, much like Mike Tyson’s ear-biting of Evander Holyfield damaged the heavyweight boxer’s credibility. ‘I didn’t feel like going back and forth,’ Mickelson explained. ‘I would do it again. I wanted to get to the next hole and I didn’t see that happening at the time without the two-shot penalty. I think knowing the rules is never a bad thing. I mean, you want to always use them in your favour. Well, there is, but just when many expected Mickelson to ‘DQ’ himself – it is an option under the same rule – after the day’s proceedings, there he was, teeing up for the final round. Then when he made his putt at the same 13th – on greens that had been heavily watered to slow them down between rounds three and four – he bizarrely broke out into a double raised-arms celebration. In a matter of 24 hours the American’s credibility among fans plummeted like a Steinhoff share listing. Which makes the eventual victory by Brooks Koepka that much more remarkable. This time last year Koepka was celebrating his first Major, having conquered Erin Hills. Then, his 16-under total had equalled Rory McIlroy’s record for lowest score in relation to par at a US Open. ‘That’s about the best I’ve ever played,’ he said 12 months ago. ‘I was striking it unbelievably, my speed control on the greens was great, and I was flighting the ball. ‘If you play a US Open without making a double-bogey, that’s pretty good,’ he said. This time he finished at one-over 281, 13 shots higher than last year, despite a pair of first-round double-bogeys at Nos 6 and 14. It was the first time since 2013 at Merion that no one broke par in the US Open. He also closed with a nervy bogey on the final hole, but that was still enough for him to hold off charging Englishman Tommy Fleetwood, who had signed for a staggering final-round 63 and ultimately the meat in the Koepka-Johnson sandwich. The perception has always been that Koepka and Johnson, who are close friends and regularly train together at the gym, are ‘gorillas’ off the tee whose greatest strength is in overpowering golf courses. There may be some truth to that – although even Dean Burmester let rip a drive of 411 yards in the first round, with the South African then holing his 140-yard approach on the 18th to sign off for a 75 – but for Koepka and Johnson to finish first and third at Shinnecock Hills showed there is so much more to their game than being able to cannon the ball off the tee. And no matter how long you are, no matter how much difference equipment has made to the sport at this rarefied level, that old cliche about how you ‘drive for show, but you putt for dough’ still rings true in this day and age. There was something Goosenesque in the way in which Koepka held his composure on these Shinnecock Hills greens, after signing off for that one-over following rounds of 75, 66, 72 and 68. Not everyone will agree with that assessment after a torrid four days at the US Open, which Compleat Golfer had rightly referred to in its last issue as ‘Four Days of Stress’. It’s been 29 years since the US Open last produced a back-to-back winner – Curtis Strange in 1988-89 – a few months after Koepka was born. Before that, one has to go to Ben Hogan in 1950 to find a champion doubling up like Koepka has done. The American is not just a pretty face with some of the biggest biceps and the capacity for lifting weights in the gym. He has a steely mentality and an uncluttered mind, much like Johnson, the world No 1, has. ‘I enjoy being pushed to the limit. Sometimes you feel like you are about to break mentally, but that’s what I enjoy,’ Koepka said. Victory at Erin Hills last year lifted Koepka to No 10 in the world, but in successfully defending at Shinnecock Hills he moved up to a career-high No 4. Chasing him all the way to the wire was Fleetwood, the ever-impressive Englishman who looks to be a serious Major champion-in-waiting. On the final green he had a seven-footer that would have seen him sign off with a 62 that would have equalled Branden Grace’s men’s Major record and forced a playoff. Remarkably, Koepka’s nerve held, having looked up to see Fleetwood’s name near the top of the leaderboard, on one over par, with the American needing to play his final 10 holes in even par to win. Which is exactly what he did, despite the bogey at the last, and in doing so he claimed the $2.16-million first prize. Swing coach Claude Harmon III had correctly picked out Koepka as an emerging force in a conversation I had with him in 2015. ‘When I started working with him he was ranked in the 200s,’ Harmon III said, ‘but he’s going to be top 10, mark my words. Look, this is a tough game but DJ and Brooks are going to be Major champions. And they won’t stop at just the one. They are similar, full of talent and ambition. They don’t let things get into their heads.’ Neither Johnson nor Koepka had yet won a Major, but they now have three combined and are ranked Nos 1 and 4 in the world. Koepka had not had an ideal 2018 after missing three months this season – including The Masters – while trying to recover from a partially-torn tendon in his left wrist. It was only at the Zurich Classic in late April that he returned to action. In five starts he made four cuts, including a runner-up finish at the Fort Worth Invitational. ‘I don’t feel like there is anybody out there with more confidence than me,’ Koepka said during the week at Shinnecock. And that he showed in four of the toughest days seen at a Major championship. As Harmon might indeed have said, ‘golf is a sport where one mustn’t overthink things’. Given the successes of Johnson and Koepka, that would seem to be the winning recipe. – This article first appeared as the cover story of the July issue of Compleat Golfer.